Here, in so many ways, is Scotland’s heart and soul. Stirling is perhaps the place where our national heritage is most vividly recalled. Always a meeting place of peoples, modern Stirling bustles with activity and offers fine shopping and leisure facilities to complement its many historic attractions. 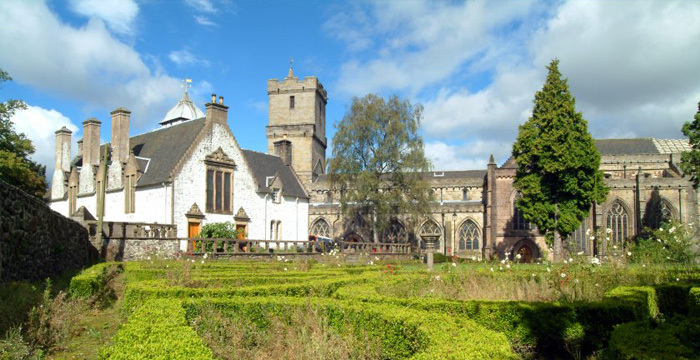 Stirling is also the ideal base from which to explore the nearby Loch Lomond and The Trossachs National Park. Stirling is the heritage capital of Scotland, and was awarded city status as part of Her Majesty the Queen’s Golden Jubilee celebrations in 2002. History seems very much alive in the streets of the Old Town, winding upwards to the castle, past the renovated Tolbooth – now a vibrant centre for the arts, the administrative heart of the renaissance burgh, and the Old Town Jail, an imposing 19th century prison, which is now a fascinating attraction presenting the horrors of life for inmates in a Victorian reform jail. Next door stands the medieval Church of the Holy Rude, where James VI was crowned and John Knox preached the sermon. Argyll’s Lodging, a beautifully restored mansion house built in the 1570s and much extended by the 1st Earl of Stirling in 1632, is your last stop before reaching the top of the hill, and the Castle. Stirling Castle, perched on its rocky crag surveying the surrounding land, is one of Scotland’s grandest castles. Its history is turbulent, its architecture outstanding. The restoration of the Great Hall took nearly 10 years to complete. Originally built during the reign of James IV, the exterior has been returned to its original golden yellow colour, by the traditional method of harling. As a military stronghold, seven great battles – including the decisive moments of Scotland’s wars of independence – took place within sight of its walls. Later, for almost three centuries prior to the Union of the Crowns in 1603, it was a favourite royal residence. The quality of the buildings is superb, particularly the Great Palace, the Chapel Royal and the Renaissance Palace. Housed in the castle is the Regimental Museum of the Argyll & Sutherland Highlanders, which colourfully recounts the 200 year history of the famous regiment. On the castle esplanade is the Royal Burgh of Stirling Visitor Centre, offering a multi-lingual audio-visual tour through 1,000 years of Stirling’s history. The Smith Art Gallery and Museum also offers a fascinating introduction to the history of the area, as well as a popular programme of special exhibitions. 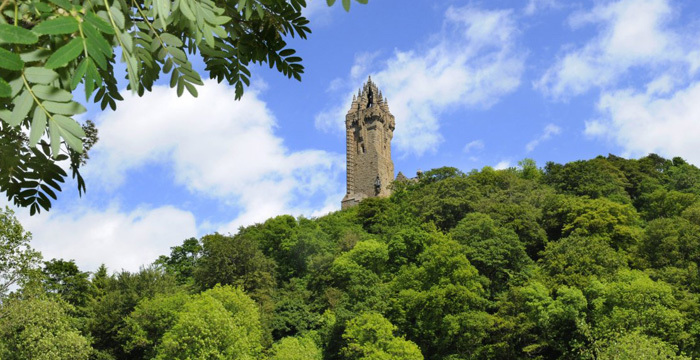 The historic theme continues with the striking National Wallace Monument, Scotland’s commemoration of its great hero, popularised in the Hollywood epic Braveheart. The Monument stands proudly on the Abbey Craig, overlooking the site of Sir William’s greatest victory, at the Battle of Stirling Bridge, in 1297. Another legendary Scottish victory – the Battle of Bannockburn in 1314 – is celebrated at the Bannockburn Heritage Centre, just two miles south of Stirling. 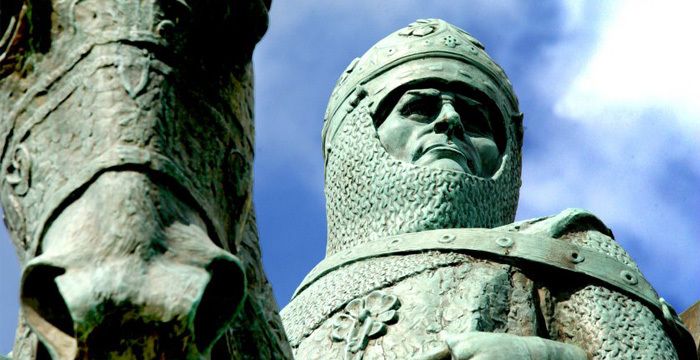 The Centre recounts the story of this famous battle, as well as the life of King Robert, of whom a striking equestrian statue sits in the grounds of the Centre. Close by is the ruined Cambuskenneth Abbey, the scene of Bruce’s Parliament of 1326 and the burial place of King James III. 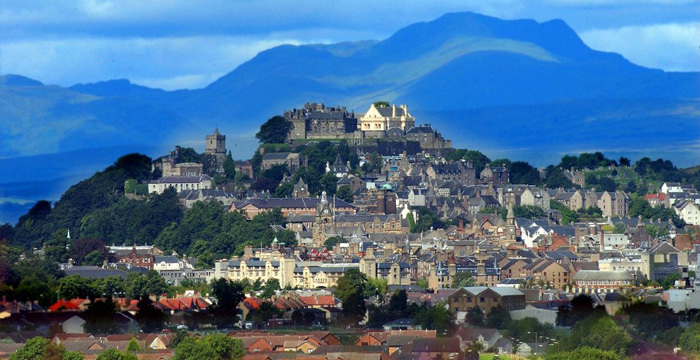 Modern Stirling is a cosmopolitan university city with a wide-ranging cultural life. Cafes and restaurants to suit all tastes abound, and the town centre offers excellent shopping opportunities in the pedestrianised streets or the covered Thistle Marches Centre. Historic Stirling, Around Stirling, Hotels, B&B/Guesthouses, Self Catering/Campsites, Attractions & Activities, Food & Drink, Other services, what’s on in and around Stirling, Dunblane and Bridge of Allan.